There are so many exhaust systems on the market you really have to do your homework to get what you want for performance, looks, quality and price. Like every one else I did some serious looking and shopping around and decided on a set of Bassani Reverse Cone Megaphone Slip-On Mufflers to give the new Electra Glide Standard Harley exhaust some sound and style. The first thing that got my attention was the appearance and then the flow thru design would give me the performance boost and sound I wanted. It wasn’t until I actually received them that I saw the quality of construction, heavy gauge of the metal and flawless chroming that I really became impressed. Installation was a piece of cake and something I feel almost every one can do themselves with basic tools around the house or home garage. 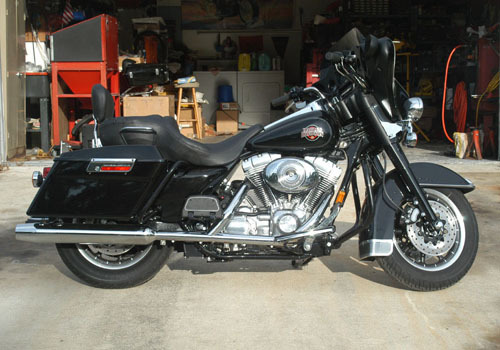 I started off by removing the saddlebags so everything was easy to get at. Next was to loosen the factory heat shield with a common screwdriver, so it would be easier to get at the muffler clamp and slide the pipe off. Using a 9/16 socket I loosened the clamp and then went to the rear and used a 1/2 socket to remove the bolts there. The pipe came off easily as it's a new motorcycle. If the muffler was super-tight or been on for some time you may want to spray something like WD-40 on the pipe around the clamp area. Let it set overnight. I installed the factory clamp on the new muffler and slid it onto the exhaust pipe. I used a couple of drops of blue Locktite on the bolt threads and installed the two back ones first. Since I was working on a lift it was easy to check if the pipe was straight. 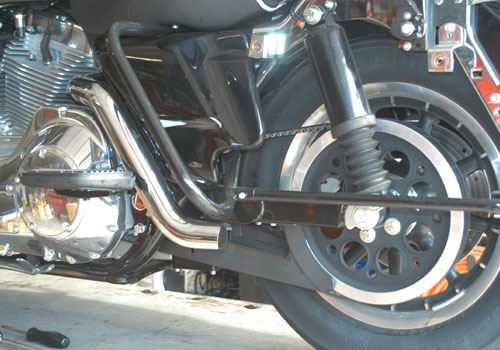 If doing on the ground, stand the motorcycle up and check alignment. When satisfied tighten rear bolts, muffler clamp and heat shield. Here's the dresser with one new, one old muffler. The same procedure is repeated on the other side with one added step. 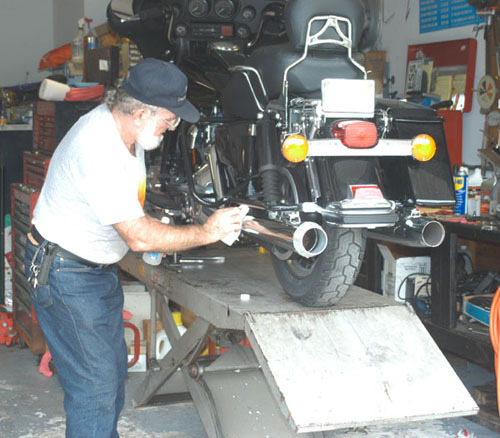 Make sure to measure the mufflers, so they are extenting to the rear equally. 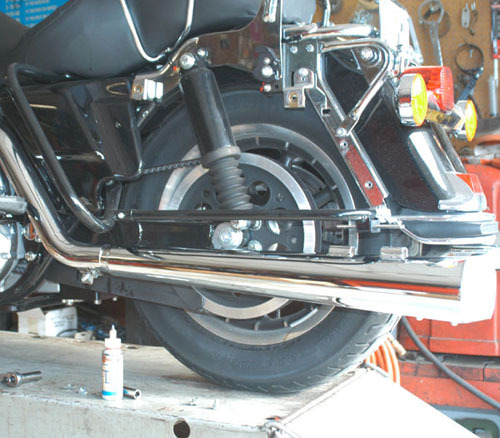 There's Rogue wiping the fresh chrome down with rubbing alcohol to remove any grease or oil. Be sure to wipe every thing down with Rubbing Alcohol and a clean cloth or paper towel to remove fingerprints and residue prior to starting engine. Cure the chrome by running the engine at idle speed for about one minute. 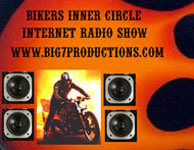 Let the motorcycle cool and repeat the operation 3-4 times. 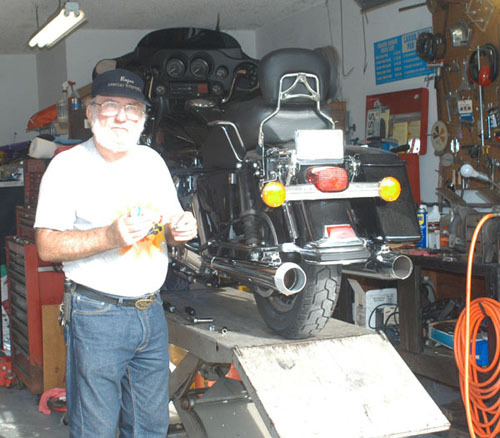 Make sure your timing and carburetor jetting is correct so as not to discolor pipes. 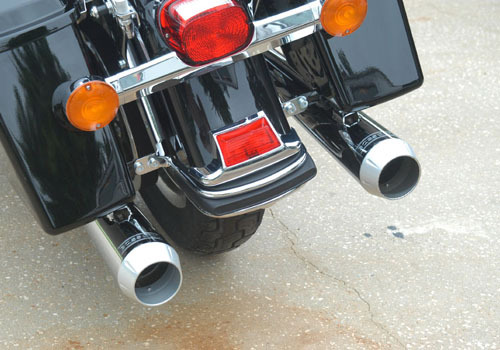 Go for a ride and listen to the cool tone of your new exhaust. To keep the pipes clean, wipe down with Rubbing Alcohol and shine with Glass Cleaner. DO NOT USE HARSH ABRASIVES! The longest part of the complete job was the road test, Ha Ha. Give me any excuse to go for a ride. I do not have means to dyno at this time other than the one at Berry's shop in Dothan or pay big money. These are glass-packed flow thru mufflers, so not adjustable. 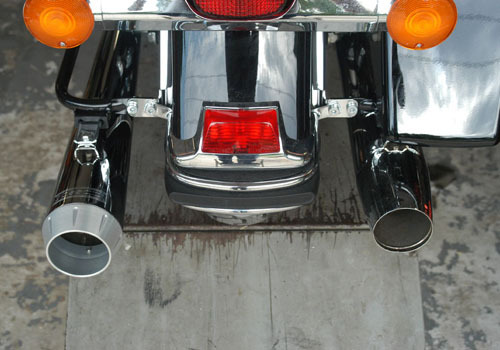 I think if you are interested in performance gain you would have to use different exhaust pipes. Installing the mufflers has accomplished what I wanted at this time which is a pleasant tone and nice appearance. 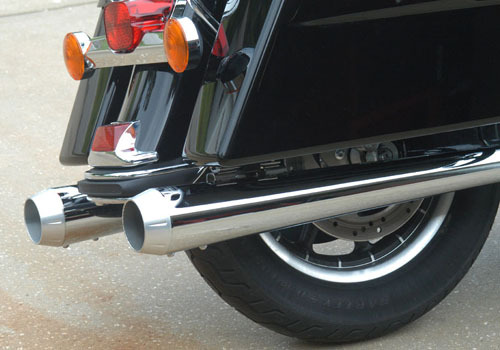 Because I'm using the stock Harley exhaust (60-40) and the mufflers being flow thru, the majority of the exhaust goes out the right side pipe and the left side looks like it hasn't been used. That's standard, no matter what mufflers you use with this system other than stock. Some people try to restrict the flow out of the rear cylinder so it feeds the left pipe, but if you do not lengthen the pipe your back-pressure isn't right. The right way to handle it would be to install the front pipes Bassani makes and use Terry Components - Thermal Velocity Fuel Injection Management System. Then ride the bike for 50 miles before attempting a Dyno Run. The Terry unit self-adjusts as you ride and you do not have to spend money for down loads and dyno tests every time you change something. For dyno info from Bassini check the following site: http://www.northcountycustoms.com/. Click on The Pipes when home page opens. Then click Power Curve. Click on Power Curve again to see photo and click on dyno to see reports.